Join other quilty folks and fiber fanatics for an informal time to sew, knit, crochet, etc. — come and go as you please. 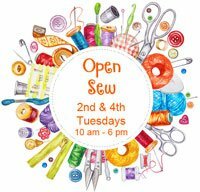 Come bring your sewing machine, project and supplies and sew with us! There is no charge to stitch and socialize.